Hello readers and welcome to another anime review! Rewind back to the dawn of fall 2012, you are looking at the fall 2012 anime chart, and you pick probably 5-7 anime you are going to watch. 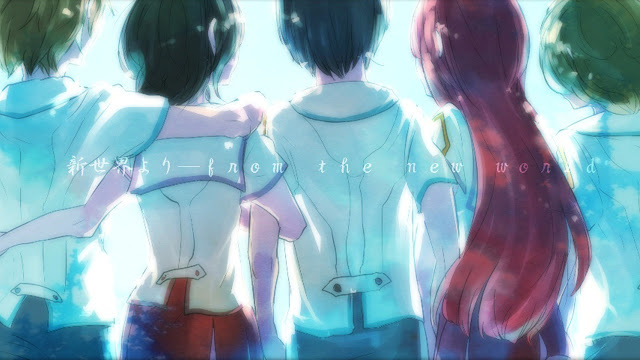 But, I can promise that the majority of you, as did I, most likely did not have Shinsekai Yori as a pick. During midst of 2013 I looked at Shinsekai Yori, the promotional picture did not catch my eye and the premises did not spark my interests. However, I did give it a shot and after finishing the anime I can promise that it is truly a spectacle, a diamond in the ruff. The characters in this anime are just something else, with Saki as it’s shining star. The main characters start off as children and by the end of the anime they are adults, with character development; there are a couple of anime who have attempted this within one season but they do not pull it off as well as Shinsekai Yori. With an anime that has twenty-five episodes, you would think it would not be enough time for proper character development from children to adults. However, Shinsekai Yori pulls this off very smoothly, which is evidently seen with Saki and Satoru, which even applies to the supporting characters as well. You will not see one character behaving as such and then the next episode they are being the polar opposite, everything is explained and shown very well. I hope you enjoyed my seemingly short review, I would not mind any feedback and if you enjoyed this series or feel enticed to watch it after reading this, feel free to leave a comment!